Short Term 12 is a 2013 American independent drama film written and directed by Destin Daniel Cretton. It is adapted from Cretton's short film of the same name, produced in 2009. The film stars Brie Larson as Grace Howard, a young supervisor of a group home for troubled teenagers. The film was the first leading performance of Larson's career. Cretton based Short Term 12 on his own experience working in a group facility for teenagers. He first wrote and produced a short film exploring this and later adapted it into a feature-length screenplay. While Larson and John Gallagher, Jr. won their roles after auditioning through Skype, most of the children featured in the film were cast through open casting calls. Filming took place over 20 days in Los Angeles, California in September 2012. Short Term 12 premiered on March 10, 2013 at the South by Southwest film festival and was released in theaters on August 23, 2013. Made on a budget of less than $1 million and given a limited release, the film brought in strong box office receipts, grossing over $2.3 million. The film was widely praised. Critics acclaimed its realism and intimacy, with particular attention drawn to Larson's performance and Cretton's screenplay and direction. Considered one of the best films of 2013, the film was among National Board of Review's Top 10 independent films of 2013. It won SXSW's Grand Jury and Audience Awards for a Narrative Feature, as well as earning three Independent Spirit Award nominations, including Best Female Lead, for Larson. Grace Howard (Brie Larson) is the young supervisor of Short Term 12, a group home for troubled teenagers. She lives with her long-term boyfriend and coworker, Mason (John Gallagher Jr.), but finds it difficult to open up to him emotionally. When Grace finds out she is pregnant, she schedules an appointment for an abortion; she eventually tells Mason about the pregnancy, who is overjoyed. She does not tell him she plans to have an abortion. At their facility, Grace and Mason focus their efforts on Marcus (Lakeith Stanfield), a resident who is about to turn 18 and is struggling with the prospect of leaving the facility. Grace bonds with Jayden (Kaitlyn Dever), a recent arrival at Short Term 12 who has a history of self-harm. Jayden distances herself from the other teenagers, as she does not intend to stay at the facility for long. When her father fails to pick her up on her birthday, she reacts violently toward the staff. After her outburst, she sits in the "cool-down room" with Grace, who shows Jayden her own scars from cutting herself. That night, Jayden leaves the facility in the middle of her birthday celebrations. Unable to force her to return, Grace follows Jayden to her father's house. After finding the house empty, they return to Short Term 12. When Jayden reads Grace a cryptic story she has written, Grace begins to suspect that Jayden was abused by her father. At a party hosted by Mason's foster parents, he proposes to Grace, who accepts. The following morning, Grace is upset by a phone call that reveals her father is being released from prison. She refuses to be consoled by Mason. She arrives at Short Term 12 to discover that Jayden has been picked up by her father overnight. She is angry at the decision to send Jayden back to her father, but her boss Jack (Frantz Turner) maintains that Jayden denied that she was abused by him. Later that day, Grace finds that Marcus has attempted to commit suicide after the death of his fish. While waiting at the hospital as Marcus is being treated, Grace breaks down. Mason becomes upset for her refusing to talk to him about how she feels; instead, she tells him that she no longer wants to marry him and that she plans to have an abortion. She returns to Jayden's father's house and breaks in, intending to injure him while he sleeps, but she is interrupted by Jayden, who suggests that they smash his car instead. Grace tells Jayden that she was sexually abused by her own father. After Jayden shows Grace bruises from blows by her father, they return together to Short Term 12, where Jayden reports her father for physical abuse. Grace goes home to apologize to Mason, who tells her that Marcus will recover. Several weeks later, Grace starts seeing a therapist. She is shown viewing an ultrasound of her fetus with Mason. Mason tells the rest of the staff about running into Marcus, who is doing well and has a girlfriend. Destin Daniel Cretton based Short Term 12 on his experiences working in a similar facility. Short Term 12 was originally conceived by Destin Daniel Cretton as a short film based on his experiences as a line staff worker at a group facility for teenagers where he had worked for two years; it served as his thesis project for his master's degree in film at San Diego State University. :5 The short film ran for 22 minutes and premiered at the 2009 Sundance Film Festival, where it won the Jury Prize in Short Filmmaking. After graduating from film school, Cretton decided to adapt the short into a feature-length screenplay, which won one of the Academy of Motion Picture Arts and Sciences' five Nicholl Fellowships in Screenwriting in 2010.:5 The largest change Cretton made when adapting the short film into a longer screenplay was changing the lead character's gender: Denim, a man loosely based on Cretton himself, became Grace, a young woman and the facility's supervisor. :5 Cretton researched similar facilities and interviewed former employees for the film, noting that the script featured stories directly told by children in these facilities from his interviews. The film was shot over 20 days in September 2012.:5 Filming took place in Los Angeles, and scenes set at the group home were shot at a former short-stay facility located near the neighborhood of Sylmar. The film was edited by Nat Sanders as it was filmed. Both the original cut of the film and the shortened director's cut were over 2 hours long, whereas Cretton wanted the final cut to be under 100 minutes. Sanders said that the original cut of the film felt too heavy and "made you feel pretty depressed about humanity", so a number of scenes were deleted or trimmed to "lighten up" the film's mood, with a final running time of 96 minutes. Short Term 12 premiered in March 2013 at the South by Southwest Film Festival in Austin, Texas, where it won the Grand Jury and Audience Awards in the Narrative Feature category and was purchased for distribution by Cinedigm. Its international premiere was held at the Locarno Film Festival in August 2013, where it received a standing ovation. In theaters, the film was given a platform release: on August 23, it was released in Los Angeles and New York City, expanding the next weekend to Phoenix, Washington, D.C., Philadelphia, Boston and Berkeley, and progressively expanding to more cities until its widest release on September 13. The film grossed $56,206 in its opening weekend, playing in four theaters, with a per-theater average of $14,052 that was considered a strong result by Forbes magazine's Mark Hughes. Overall, it earned a total of $1,013,100 in North America over a total of 26 weeks in theaters, with a widest release of 75 theaters, and $632,064 outside the United States for a total of $1,645,164. Brie Larson's performance in her first leading role received widespread praise from critics. On Rotten Tomatoes the film has an approval rating of 98% based on 160 reviews, with an average rating of 8.9/10. The site's critical consensus reads, "Short Term 12 is an emphatic, revealing drama that pulls audiences into the perspective of neglected youths." On Metacritic the film has a weighted average of 82 out of 100, based on 36 critics, indicating "universal acclaim". Germain Lussier of /Film wrote of the film, "The whole thing just feels perfect or magical, a shining example of what cinema is all about", adding, "The performances are mindblowing, the writing sharp, and the direction beautiful. It's a very special movie." In Variety, critic Peter Debruge wrote, "the stunning SXSW fest winner puts the recent Park City competition lineup to shame ... this compelling human drama finds fresh energy in the inspirational-teacher genre, constantly revealing new layers to its characters." In a review for the Los Angeles Times, Kenneth Turan described Short Term 12 as "a small wonder", "a film of exceptional naturalness and empathy", and "moving and intimate", offering particular praise to the film's honesty and plausibility. Peter Bradshaw of The Guardian, on the other hand, criticized the film's credibility, describing it as "well intentioned, but somehow inauthentic" with a "too-cute-to-be-true ending". The Hollywood Reporter's John DeFore called the film "genuinely moving" and "effortlessly balanced ... Brett Pawlak's handheld camerawork and Cretton's unsentimental direction have a frankness that acknowledges the dramatic extremes in these lives without needing to parade it before the audience." Manohla Dargis from The New York Times also praised Cretton's direction, saying he "brings you into this coed group home and the lives of its inhabitants casually, with images and scenes that, no matter how transparently considered, feel as if they had been caught on the fly." Brie Larson's performance as Grace was singled out for praise by critics. Katie Walsh of Indiewire wrote, "[Larson] manages to convey her character as someone fierce and strong and steely, and also utterly fragile, delicate, scared and broken ... It's an incredible emotional and physical performance, and she's a whirlwind." Similarly, Empire critic Ian Freer felt that Larson gave "a whirling dervish of a performance ... She, like the film, breaks your heart and raises your spirit in one fell swoop." 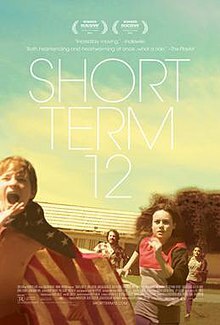 Despite the universal acclaim from critics and audiences alike, Short Term 12 was completely shunned by every major industry awards organisation from receiving a nomination, especially at the Academy Awards, an action criticized by numerous critics, publications and audience members. Major criticism was drawn towards the perceived snub of Brie Larson, whose performance was widely acclaimed and was cited by various critics and publications as one of the best performances of the year. While Forbes called her snub "shocking", The Atlantic called it "disappointing" but "hardly shocking", considering it being a small budgeted independent film. ^ "Short Term 12 (15)". Verve Pictures. British Board of Film Classification. September 13, 2013. Retrieved September 13, 2013. ^ a b c Hughes, Mark (August 27, 2013). "2013's Best Film 'Short Term 12' Does Strong Business In Limited Release". Forbes. Retrieved April 22, 2014. ^ "Short Term 12 (2013)". The Numbers. Retrieved September 13, 2013. ^ a b Goldstein, Jessica (August 31, 2013). "'Short Term 12' writer-director Destin Daniel Cretton on real-life inspiration behind his film". The Washington Post. Retrieved April 22, 2014. ^ a b c d e f g h "Short Term 12" (PDF) (Press release). Verve Pictures. 2013. Retrieved April 22, 2014. ^ a b Olsen, Mark (August 24, 2013). "'Short Term 12' beats long odds". Los Angeles Times. Retrieved April 22, 2014. ^ Caceda, Eden (December 17, 2013). "Finding A Voice". Filmink. Archived from the original on October 6, 2014. Retrieved July 13, 2014. ^ Williams, Alex (September 15, 2013). "Brie Larson talks about filming "Short Term 12"". The Daily Texan. Retrieved April 22, 2014. ^ Stone, Abbey (August 29, 2013). "John Gallagher Jr. On 'The Best Script He's Been Sent in 14 Years' (And It's Not By Aaron Sorkin)". Hollywood.com. Retrieved April 22, 2014. ^ a b Zakarin, Jordan (March 13, 2013). "SXSW: How 'Short Term 12's' Brie Larson, Destin Cretton and Some Kids Won the Festival's Top Prize". The Hollywood Reporter. Retrieved April 22, 2014. ^ Cuttler, Andrea (August 21, 2013). "Short Term 12's Brie Larson: Shadowing Foster-Care Workers "Changed Me for the Rest of My Life"". Vanity Fair. Retrieved April 22, 2014. ^ a b Davidson, Jaye Sarah (February 28, 2014). "FILMMAKER SPOTLIGHT: Behind the Screen with Short Term 12 Editor Nat Sanders". iheardin.com. Archived from the original on April 7, 2015. Retrieved April 22, 2014. ^ a b c Hopewell, John (August 11, 2013). "Memento Rolls Out 'Short Term 12' (EXCLUSIVE)". Variety. Retrieved April 22, 2014. ^ Lussier, Germain (August 20, 2013). "/Film Interview: 'Short Term 12′ Director Destin Daniel Cretton". /Film. Retrieved April 22, 2014. ^ "Short Term 12: Summary". Box Office Mojo. Retrieved April 22, 2014. ^ "Short Term 12: Foreign". Box Office Mojo. Retrieved April 22, 2014. ^ "Short Term 12". Rotten Tomatoes. Retrieved May 15, 2016. ^ "Short Term 12 Reviews". Metacritic. Retrieved September 19, 2013. ^ Lussier, Germain (August 24, 2013). "'Short Term 12' Review: SXSW Grand Jury Winner Is a Funny, Emotional Piece of Cinematic Perfection". /Film. Retrieved August 27, 2013. ^ Debruge, Peter (March 12, 2013). "SXSW Review: 'Short Term 12′". Variety. Retrieved August 27, 2013. ^ Turan, Kenneth (August 22, 2013). "Review: The exceptional 'Short Term 12' comes by its pain honestly". Los Angeles Times. Retrieved April 25, 2014. ^ Bradshaw, Peter (November 1, 2013). "Short Term 12 - review". The Guardian. Retrieved July 25, 2014. ^ DeFore, John (March 14, 2013). "Short Term 12: SXSW Review". The Hollywood Reporter. Retrieved August 27, 2013. ^ Dargis, Manhola (August 23, 2013). "Caretakers Needing Some Care Themselves". The New York Times. Retrieved April 22, 2014. ^ Walsh, Katie (March 10, 2013). "SXSW Review: 'Short Term 12' A Heartrending, Heartwarming & Authentic Portrait of Life At A Foster Care Facility". Indiewire. Retrieved August 27, 2013. ^ Freer, Ian. "Short Term 12". Empire. Retrieved April 25, 2014. ^ "'Her' Tops Austin Film Critics Association 2013 Awards". Austin Film Critics Association. December 17, 2013. Retrieved November 24, 2014. ^ "The 14th Annual Black Reel Awards Nominations". Black Reel Awards. December 18, 2013. Retrieved April 24, 2014. ^ "2013 Chicago Film Critics Association Award Winners". Rotten Tomatoes. December 16, 2013. Retrieved April 24, 2014. ^ "American Hustle, 12 Years A Slave Lead BFCA's Critics Choice Movie Awards Nominations". Deadline Hollywood. December 17, 2013. Retrieved December 19, 2013. ^ "The 2013 Detroit Film Critics Society Awards". Detroit Film Critics Society. December 13, 2013. Retrieved April 24, 2014. ^ "The winners of Film Fest Gent". Flanders International Film Festival Ghent. October 22, 2013. Retrieved April 24, 2014. ^ Rosen, Christopher (December 2, 2013). "Gotham Awards 2013 Winners Include Brie Larson, 'Llewyn Davis'". The Huffington Post. ^ "Short Term 12". North of Superior Film Association. Archived from the original on April 24, 2014. Retrieved April 24, 2014. ^ Atkinson, Katie (March 1, 2014). "Independent Spirit Awards 2014: The winners list". Entertainment Weekly. Retrieved April 24, 2014. ^ "Palmarès" (PDF) (Press release). Festival del film Locarno. August 17, 2013. Archived from the original (PDF) on August 9, 2014. Retrieved November 24, 2014. ^ Thompson, Anne (June 23, 2013). "LAFF Winners: 'Mother, I Love You,' 'Code Black' Win Jury Awards; Audience Awards Go to 'Short Term 12,' 'Wadjda,' 'American Revolutionary'". Indiewire. Retrieved August 27, 2013. ^ Millar, Lindsey (May 23, 2013). "Little Rock Film Festival's downtown debut a success". Arkansas Times. Retrieved August 27, 2013. ^ Tekula, Sara (June 18, 2013). "2013 Maui Film Festival Audience Awards Announced". Maui Film Festival. Retrieved August 27, 2013. ^ "Rising Star Award Tribute to Brie Larson". Maui Film Festival. Retrieved August 27, 2013. ^ "Awards". Nantucket Film Festival. June 2013. Retrieved April 24, 2014. ^ Davis, Clayton (December 4, 2013). "National Board of Review Chooses 'Her' as Best Film, Will Forte and Octavia Spencer Land Wins". The Awards Circuit. Retrieved April 23, 2014. ^ "The Online Film Critics Society Announces 17th Annual Awards". Online Film Critics Society. December 9, 2013. Retrieved December 19, 2013. ^ "San Diego Film Critics Nominate Top Films for 2013". San Diego Film Critics Society. December 10, 2013. Retrieved December 19, 2013. ^ Lodge, Guy (December 13, 2013). "'Wolf of Wall Street' lands some top mentions". HitFix. Retrieved July 25, 2014. ^ Feinberg, Scott (January 23, 2014). "Santa Barbara Film Fest to Recognize Seven Performers With Virtuosos Award". The Hollywood Reporter. Retrieved April 23, 2014. ^ Kilday, Gregg (December 2, 2013). "Satellite Awards: '12 Years a Slave' Leads Film Nominees". The Hollywood Reporter. Retrieved December 19, 2013. ^ "About the Festival". Tallinn Black Nights Film Festival. Retrieved April 24, 2014. ^ "Seminci, Valladolid International Film Festival 2014". Valladolid International Film Festival. Archived from the original on January 23, 2014. Retrieved April 24, 2014. ^ a b Hughes, Mark (January 16, 2014). "How The Oscars Got It Wrong". Forbes. Retrieved May 25, 2017. ^ Zuckerman, Esther (August 26, 2013). "Brie Larson Gives the Performance to See Right Now in 'Short Term 12'". The Atlantic. Retrieved May 25, 2017. ^ Playlist Staff, The (December 3, 2013). "The 25 Best Breakthrough Performances Of 2013". IndieWire. Retrieved May 25, 2017. ^ Kohn, Eric (December 12, 2013). "Critic's Picks: The Top 10 Best Female Lead Performances of 2013 According to Indiewire's Film Critic". IndieWire. Retrieved May 25, 2017. ^ Orr, Christopher (January 16, 2014). "The 2014 Oscar Nominations: Good, Bad, and Crazy". The Atlantic. Retrieved May 25, 2017.